In this episode Andy and John are behind the scenes at the Stoke Newington Literary Festival and their guest is the world famous librarian, Nancy Pearl. Nancy was for many years the Executive Director of the Washington Center for the Book at Seattle Public Library, and her book recommendation radio broadcasts made her famous, first in Seattle and then internationally. Building on this with her bestselling books: Book Lust, More Book Lust, and Book Crush, Nancy was named 2011 Librarian of the Year by Library Journal. She is the only living librarian (to date) to have an action figure made in her honour. In 2017, she published her first novel, George & Lizzie. 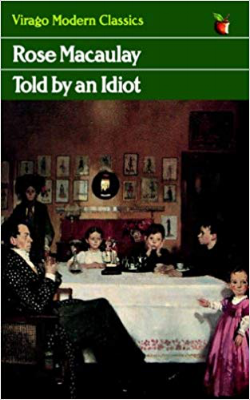 The book Nancy will be discussing is Rose Macaulay's Told By An Idiot, first published in 1923 and reissued by Virago in their Modern Classics series in 1983. In this episode Andy also is very excited by Less, the Pulitzer Prize winning novel by Andrew Sean Greer and John enthusiastically recommends Girl With Dove: A Life Built By Books by Sally Bayley.